In New York State, there are only three poisonous snakes: the timber rattlesnake, the massasauga, and the copperhead. All three are uncommon and are rarely found around the home, but if they are, it can be a dangerous problem. The snakes most commonly found in New York State are garter snakes and water snakes, though there are 17 species total. All of these are harmless, and they are beneficial to the controlling rodent populations. Snakes are scaly, legless reptiles that slither across the ground. They're often seen sticking their tongue in and out, as if they are tasting the air. All venomous snakes have triangle-shaped heads and pits between their eyes and nostrils containing infrared-sensing organs. They also also have elliptical-shaped pupils as opposed to the round pupils found in other snakes. Rattle snakes have a rattle at the end of their tail. If you step near them, they will shake their tail warning of their presence. Copperheads are identified by their flat, copper colored heads. 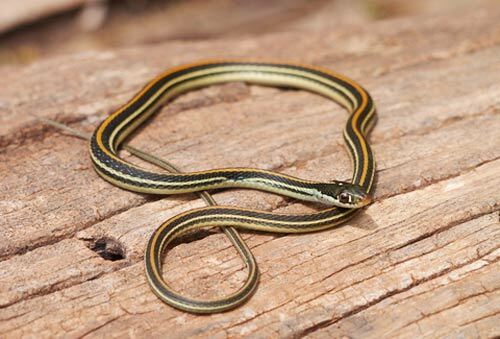 Garter snakes are thin, often black snakes with yellow stripes running along their bodies. Some varieties can grow upwards of several feet, while others won't grow more than a few inches. Water snakes are found in almost every body of water in the state. They're typically brown or black with lighter splotches and marks. They can grow up to 42 inches, and they're know to be agressive. Because of their size and agression, they're commonly mistake for a cottonmouth snake. But Cottonmouths don't live in New York. Snakes often enter homes and yards in search of food or sheltered places to hibernate for the winter. They look for areas that attract rodents like houses, barns, and gardens. They also look for dark, damp places in yards to retreat to after catching a meal, like lumber piles, discarded tires, and loose rocks. Most snakes are not dangerous, but can still be frightening if they're in your home, or if large snakes are on your property (Imagine seeing an 8 foot black rat snake in your lawn!). If you're having a snake problem in or around your home, please call us at 716-208-5110. We will quickly and humanely locate and remove the snakes, and then seal the entry points to your home and repair any damage the snakes may have caused.